Off to the Corcovado? See our insider advice for a queue-free visit as well as opening times and phone numbers! This is the most popular way to get to Corcovado. The train leaves from Cosme Velho (check the buses to get there, as the closest metro - Largo do Machado - is quite far). Tickets can be bought at the RioTur kiosk (9, Rua da Candelária, Centro) or on the website. To guarantee your places, without queueing, we highly recommend buying your tickets online. Note, there is a R$5,00 commission when buying the tickets online, but we think it’s worth the comfort of having a fixed entry time and avoiding the queues. Credit & debit cards are accepted. Tickets are valid for one entrance only. The voucher acquired by internet should be exchanged at the ticket office of the Cosme Velho, 30 minutes before embarking. To change your ticket, contact: (11) 4412 5454 they will need you to inform the voucher code and the CPF or Passport number. This is another good option to get to Corcovado. We highly suggest this van service and not any of the many other pirate van services because it will take you straight to the monument at the top without the need to stop at the Paineiras Point, (get a huge queue) and pay for yet another van (which is exclusively from this company anyway) to get to the Christ Redeemer monument. Tickets can be bought at the pick-up location or online paineirascorcovado.com.br. NOTE: All vans leaving from Cosme Velho where the train can be taken are pirate vans. Praça do Lido in Copacabana, Daily, from 8h - 17h. Largo do Machado, Flamengo Daily, from 8h - 16h. Estrada das Paineiras, next to where the Hotel Paineiras used to be (Paineiras Point). Daily, from 8h - 18h. Note: the car parking is available for cars and motorcycles at the top of Paineiras (they will not be allowed further than this point). From this point, vans can transport visitors for the rest of the journey up to the statue of the Christ Redeemer. 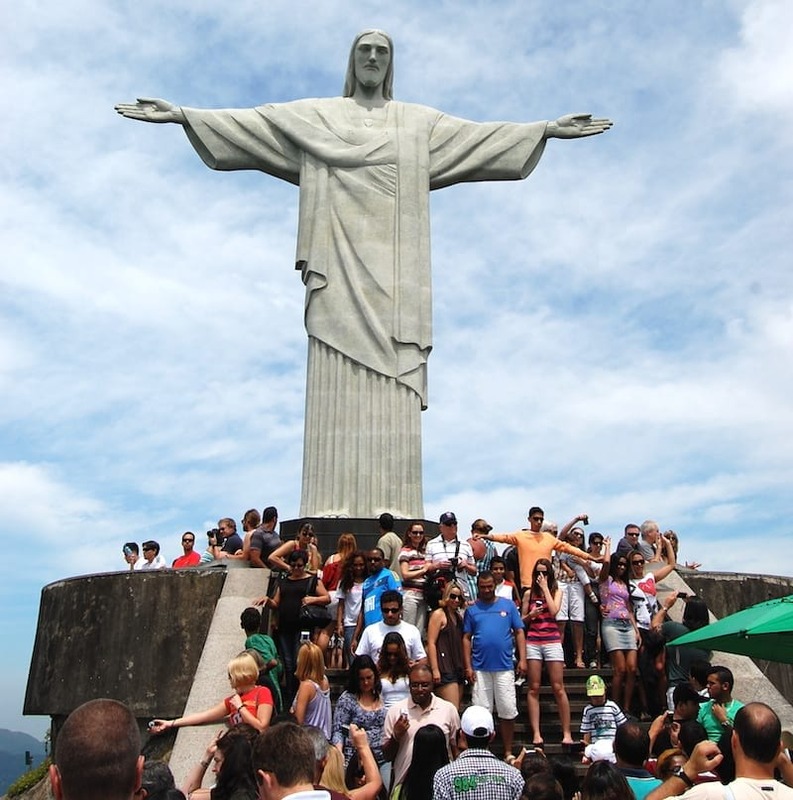 We highly recommend you get your tickets for the van from the Paineiras point to the Christ Redeemer online: paineirascorcovado.com.br and not on site, as the Paineiras point queue is THE queue to be avoided. This is the meeting point for people coming by car, motorcycle, taxi, or by foot and the queue can be enormous. Tour guides, upon presentation of up-to-date EMBRATUR ID cards. Brazilian visitors, or foreigners that can prove permanent residence in Brazil, that are 60 yrs old or over. Call between 8 and 9am to get a quick answer. The Paineiras point is located next to where the old Hotel Paineiras used to be. Feel free to comment or give your opinion on The Corcovado & the Christ Redeemer monument. However, please agree to respect our terms. Please don’t post defamatory, insulting or disparaging comments- as we will have to moderate them. Instead, explain what happened in a factual way.